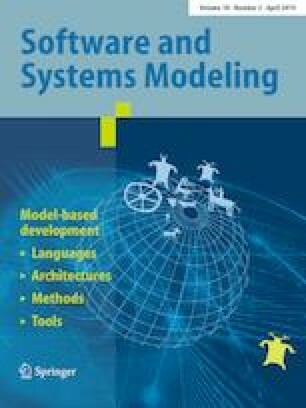 Domain-specific meta-models play an important role in the design of large software systems by defining language for the architectural models. Such common modeling languages are particularly important if multiple actors are involved in the development process as they assure interoperability between modeling tools used by different actors. The main objective of this paper is to facilitate the adoption of new domain-specific meta-model versions, or a subset of the new architectural features they support, by the architectural modeling tools used by different actors in the development of large software systems. In order to achieve this objective, we developed a simple measure of meta-model evolution (named NoC—Number of Changes) that captures atomic modification between different versions of the analyzed meta-model. We evaluated the NoC measure on the evolution of the AUTOSAR meta-model, a domain-specific meta-model used in the design of automotive system architectures. The evaluation shows that the measure can be used as an indicator of effort needed to update meta-model-based tools to support different actors in modeling new architectural features. Our detailed results show the impact of 14 new AUTOSAR features on the modeling tools used by the main actors in the automotive development process. We validated our results by finding a significant correlation between the results of the NoC measure and the actual effort needed to support these features in the modeling tools reported by the modeling practitioners from four AUTOSAR tool vendors and the AUTOSAR tooling team at Volvo Cars. Generally, our study shows that quantitative analysis of domain-specific meta-model evolution using a simple measure such as NoC can be used as an indicator of the required updates in the meta-model-based tools that are needed to support new meta-model versions. However, our study also shows that qualitative analysis that may include an inspection of the actual meta-model changes is needed for more accurate assessment. The authors would like to thank Swedish Governmental Agency for Innovation Systems (VINNOVA) for funding this research (Grant No. 2013-02630) and all our industrial partners for contributing to the presented work. The authors would also like to thank Maxime Jimenez who helped us in the assessment of the presented data model for measuring the evolution of UML and Modelica meta-models. The calculation of the NoC for the Elements that belong to both MetaModel versions is presented in the CompareElements function in Listing 2. For each such Element, we first check whether its ClassifierName, Name, Note, Stereotype and Type have changed between the two versions and increment the NoC counter by one for each change (Listing 2, lines 2–6). We then look for changes in its Attributes, Connectors and TaggedValues considering their modifications, additions and removals (Listing 2, lines 8–43), in the way explained below. The calculation of the NoC for the Elements present in only one MetaModel version (Elements that are either added or removed depending on the precedence of the compared meta-model versions) is presented in the MaxElementModifications function in Listing 3. For each such Element, we increment the NoC by the maximum number of possible modifications to this Element, i.e., five (one for each ClassifierName, Name, Note, Stereotype and Type, as indicated by the initial value NoC = 5 in Listing 3, line 1) plus the maximum number of possible modifications to its Attributes, Connectors and TaggedValues (Listing 3, lines 2–9), in the way explained below. The calculation of the NoC for the Attributes that belong to both Element versions (Listing 2, lines 8–10), where the Attributes are uniquely identified by their UUID, is presented in the CompareAttributes function in Listing 4. For each such Attribute, we first check whether its LowerBound, Name, Note, Type and UpperBound have changed between the two versions and increment the NoC counter by one for each change (Listing 4, lines 3–8). We then look for changes in its TaggedValues considering their modifications, additions and removals (Listing 4, lines 10–21), in the way explained below. The calculation of the NoC for the Attributes that are present in only one Element version (Attributes that are either added, see Listing 2, lines 16–18, or removed, see Listing 2, lines 12–14, depending on the precedence of the compared element versions) is presented in the MaxAttributeModifications function in Listing 5. For each such Attribute, we increment the NoC by the maximum number of possible modifications to this Attribute, i.e., six (one for its LowerBound, Name, Note, Stereotype, Type and UpperBound each, as indicated by the initial value NoC = 6 in Listing 5, line 1) plus one for each of its TaggedValues (Listing 5, lines 2–3). The calculation of the NoC for the Connectors that belong to Elements is done in the same way as for the Attributes, so we skipped the description of the CompareConnectors (Listing 2, line 22) and MaxConnectorModifications (Listing 2, lines 26, 30) functions. The only difference is that in the CompareConnectors function, we increment the NoC counter by one for each change in the Note, SourceCardinality, Stereotype, TragetCardinality and Type fields between the two versions of the compared Connector, instead of LowerBound, Name, Note, Stereotype, Type and UpperBound fields (Listing 4, lines 3–8). The pseudo-code of the MaxConnectorModifications function is the same as for the MaxAttributeModifications function, but it was still defined as a standalone function for the sake of symmetry. Finally, for each TaggedValue that belongs to both compared versions of one Element, Attribute, or Connector (Listing 2, lines 32–35 for Elements and Listing 4, lines 10–13 for Attributes), where the TaggedValues are uniquely identified by their Name, we check whether its Value has changed between the two versions and increment the NoC counter by one if it has. Additionally, for each TaggedValue that is present in only one version of the compared Element, Attribute, or Connector (TaggedValue that is either added, see Listing 2, lines 41–43 for Elements and Listing 4, lines 19–21 for Attributes, or removed, see Listing 2, lines 37–39 for Elements and Listing 4, lines 15–17 for Attributes, depending on the precedence of the compared versions of the element, attribute or connector), we increment the NoC by one.